"New Year S Dance At The Country Club"
HONK and TOOT! It's New Year's Eve, and The Aldrich Family is throwing a party! December 31st is The Feast of Saint Sylvester. Not much is remembered about St. Sylvester, even though his papacy occurred at a critical time in the history of the Roman Catholic Church. Sylvester was Pope when Constantine the Great converted to Christianity. Constantine was cured of leprosy and baptized by Sylvester then decreed that authority over Rome and the western portion of the Roman Empire should go the Holy See. 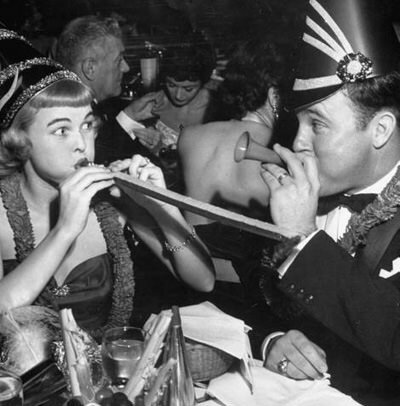 Not being able to remember much about Sylvester may be a good symbol for New Year's Eve, since not being able to remember much of your New Year's Eve Party can be a good sign that it was a really good party! More important than remembering the Party itself is finding the right sweetheart on whom to bestow your New Year's Eve Kiss. Since the New Year's Eve Party is the final bash of the Holiday Season before New Year's Day, the end of several weeks' worth of binge eating, parties, glamorous outfits, the craziness of shopping, and general celebrating, a kiss from your best girl or fella at the stroke of Midnight on New Year's Eve is an act of purification that can set the tone for your whole year. Of course, any excuse for a sweet kiss is a good excuse, no matter what Leroy ("Leerroooooy!" as Gildy would bellow) or Henry Aldrich might think! Whether or not being able to recall your antics at the Party is a good thing or not, we can agree that the evening before new years day is great time to enjoy happy memories from the past year as well as from years past. Your friends in the world of OTR have many wonderful memories to share. 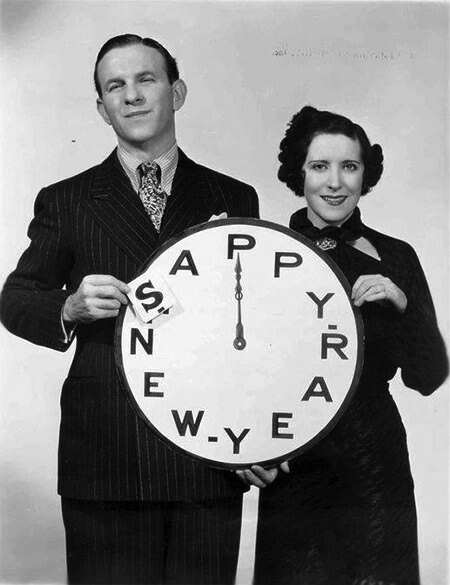 Our New Year's Eve Collection includes five New Year's Eve Celebrations with Amos 'n' Andy, fourteen with Fibber and Molly, nine with The Great Gildersleeve plus one with Honest Harold, three with The Life of Riley, two with George Burns and Gracie Allen, two with Milton Berle, three with Red Skelton, four with Phil Harris and Alice Faye, nine with Jack Benny, and many more! Come join us, because Kitty brought some fine champagne. We have had quite a night already - Fibber McGee opened the closet to find some noisemakers and what a mess! 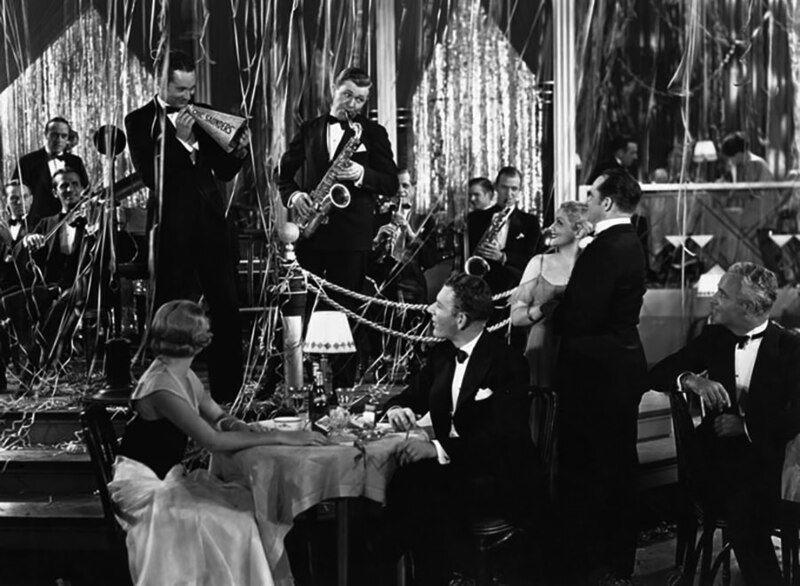 Throckmorton P. Gildersleeve is hitting on Miss Brooks, and Jack Benny and Red Skelton are trying to outdo one another.Make a resolution to get this collection of fun and riotous New Year's themed shows. In fact, if you want to hear the whole collection before the Ball Drops, you will have to start listening around noon on December 29. Be the first to comment on "New Years Eve"